Best of the season. See you in January. Indeed it is....here we mean. [Click on the image to enlarge] And with it the Canadian Magazines blog is taking its annual break, returning January 2, when we'll present our look-back at the year 2017. All the best for the Christmas and New Year season. The study shows that actual consumer behaviour around magazine reading and buying makes a compelling business case for magazines at retail. Retail stores that have maintained magazine space and selection report that they have maintained sales. Shelf space allocation, especially at checkout locations, and reduced checkout waiting time are major, retailer-controlled influences on sales volumes of magazines. Red Point Media Group is launching a new, annual magazine called Invest Calgary, focussed on the business sector in Alberta's largest city. It's being done in partnership with Calgary Economic Development. The publishing team is Joyce Byrne and Pritha Kalar. The annual will distribute 135,000 copies and a full-page ad is $6,750. The launch issue is 84 pages, perfect bound and allocates 16 pages to advertising. Pantone's 2018 Colour of the Year is ultra violet, which it describes as “provocative and thoughtful,” noting it “communicates originality, ingenuity, and visionary thinking that points us towards the future." The annual unveiling of the COY is part-promotion, part conversation-starter. The formal name of the colour on the chip is 18-3838-Ultra-Violet . ”Ultra Violet is “multi-faceted,” says Leatrice Eiseman, executive director of the Pantone Color Institute and author of numerous color books, including most recently The Complete Color Harmony, Pantone Edition. “It’s a little complicated, which we feel is one of [the color’s] appeals. It’s not easy, not chili pepper red and all hot and dancy.” It’s this complexity that Eiseman believes will attract designers to the color: “Designers invariably get purples,” she says. “You talk to people on the street, though, and they’re more skeptical. That’s why we think designers will like it: you do have to have a conversation about” Ultra Violet and its uses. 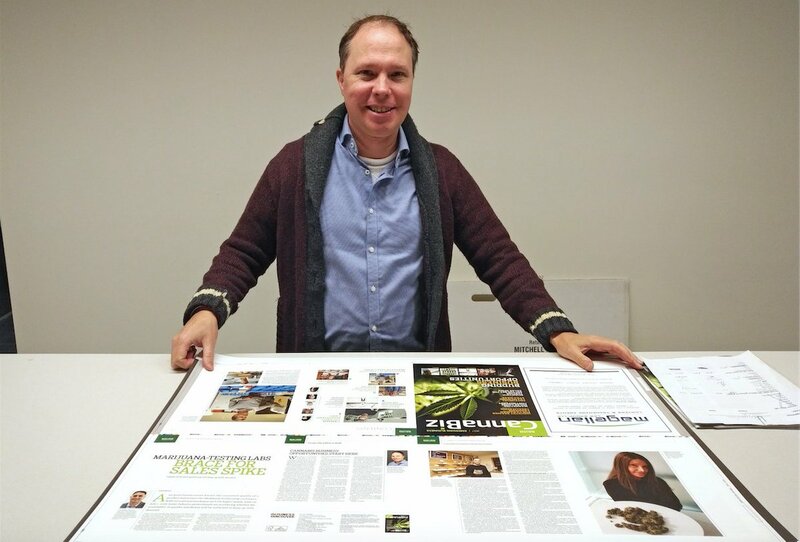 Glacier Media is tomorrow launching a glossy business-to-business print magazine called CannaBiz -- mostly circulating in BC -- that reports on business opportunities in the impending legalized marijuana business in Canada. The editor is Glen Korstrom (looking over proofs, above) and the new publication is a companion to Business in Vancouver. Maryam Sanati, the editorial director of Strategic Content Labs at St. Joseph Media was named best content director at the annual Pearl Awards administered by the Content Council. Sanati, a former editor in chief of Chatelaine magazine, who also worked for The Globe and Mail and Report on Business magazine, was cited for her work with consumer media brands such as Toronto Life, Fashion, Where Canada and Canadian Family and most recently for leading a team of writers, editors, art directors and visual artists in creating a dynamic range of content across 50,000 square feet of exhibition space at the National Music Centre, in Calgary. David Wilson's final column as publisher and editor of the UC Observer in the end was a thank you to a writer whose first person story about health care has caused a good deal of talk. Catherine Gordon of Toronto wrote about her own struggle with breast cancer and the almost eerie coincidence that her sister in California was struggling with the same thing at the same time; their respective financial burdens were much different, however. And Gordon let Wilson know that as a result of her article, U.S. Senator Bernie Sanders's staff had contacted her about filming an interview for a documentary as part of his campaign to get single payer health coverage in his country. "Thirty years ago, I was drawn to The Observer because it was a mission-driven magazine committed to fostering a healthier and more just world. As editor and publisher for the past 11 years, I’ve had the privilege of broadening the scope of the magazine while holding fast to those principles — and to do so in the company of extraordinary colleagues to whom I owe an enormous debt of gratitude. "Catherine Gordon’s story was shaped by the values that inform just about everything we print in The Observer. We still speak to a mainly United Church audience, but it’s extremely gratifying when people outside our immediate sphere see merit in what we do — doubly so when people like Bernie Sanders reach out in common cause." Wilson is being succeeded in January by Jocelyn Bell.